Water is essential to life, beautiful and extremely hazardous; crossing water is one of the most dangerous undertakings in the outdoor world and the decision to do so must never be taken lightly. Inevitably though, there will come a time when the traveller is left with no choice and it is at these moments that prior experience and training become invaluable. Safe crossing depends on the affective assessment of the hazard. When training our students to make water crossings, we encourage them to use the acronym: WASPTAR – What type of water is it? Will it be cold? Are there other hazards? Is it feasible to attempt? Water – What type of water is it? Will it be cold? Are there other hazards? Is it feasible to attempt? 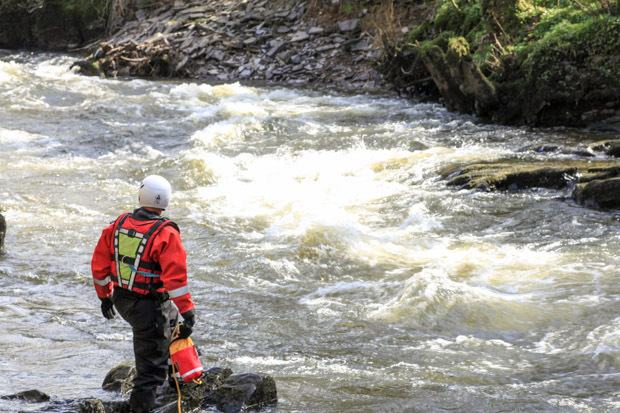 Assess – What is downstream/upstream? What is bed composed of? Where are the eddies? How strong is the flow? How fit are you/your group. How well can they swim? 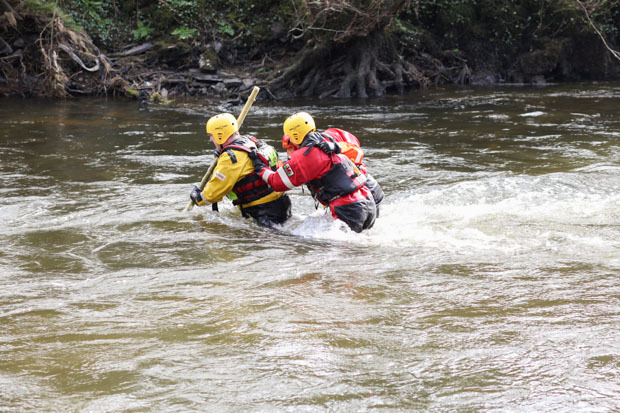 Search – Look for easy and safe places to enter and exit the water. Where is the best place to cross? Could you wade instead of swimming? Plan – Make sure everyone knows what’s happening and think about communication. Fast moving water is noisy so signals may be best. Technique – Choose an appropriate technique for your group and rehearse on dry land. Avoid using a rope unless trained and never tie yourself in. Anticipate – Think about what could go wrong. What happens if you miss the exit point? Will you have spotters upstream? 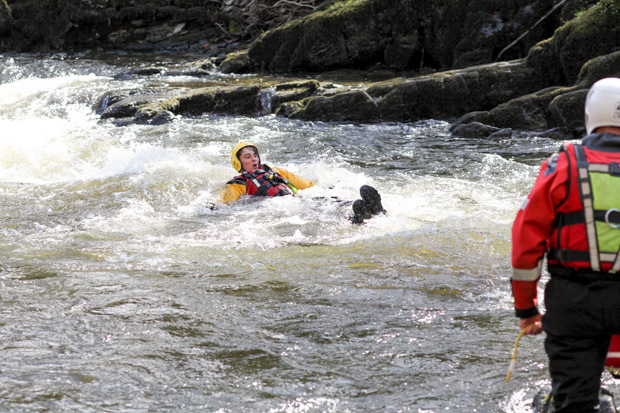 Will you have rescues in place downstream? How will you rewarm on the other side? Rewarm – Make sure that everyone takes the time to rewarm, change into dry clothes and have an energy rich drink and/or something to eat. The above process is often easier to go through if discussions are had as long as these do not become protracted. Good leadership and decision making are key and these are made easier with the benefit of experience. 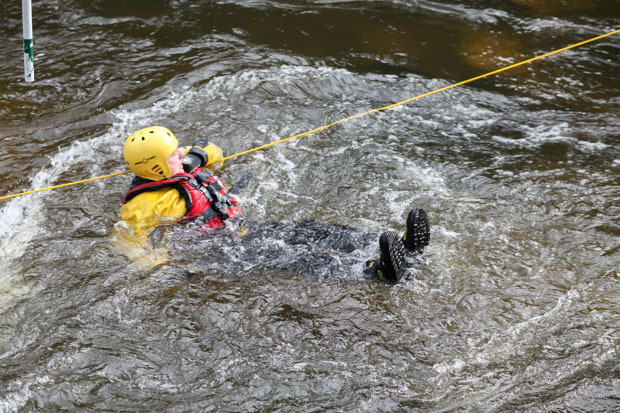 With this in mind, senior members of the Woodlore outdoor team joined members of the UK International Search and Rescue team for a session of outstanding training focusing on how to wade, swim and rescue in fast-moving water. A stable formation for three or more. The front team member creates an eddy in which the others can stand. They in turn pull the front person down so that their feet maintain contact with the bed. 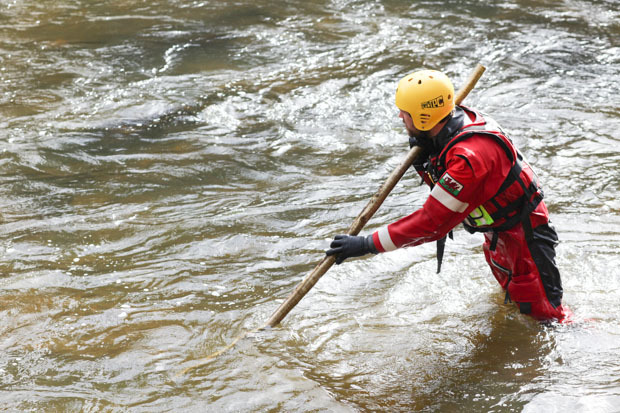 A pole will increase stability and the formation should be tight; the one above is a bit loose and the water can be seen powering into the back two members. Another stable formation which makes good use of the eddies created by the front members. The group rotates across the river, pulling each other down as they progress. 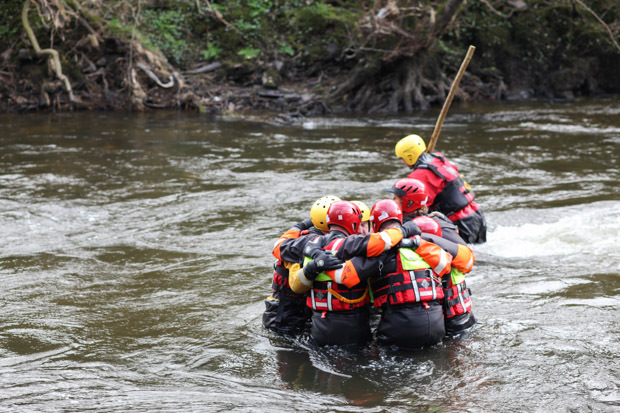 As team members find themselves with their backs to the full force of the flow they will need extra support. Again, this formation should be tight to prevent water entering at speed and causing instability. Solo crossing is challenging and less stable than crossing in groups. Use a stout pole to provide balance and a more stable formation. Using a tensioned line that is not fixed at either end allows it to be released should a dangerous snag occur during the crossing. 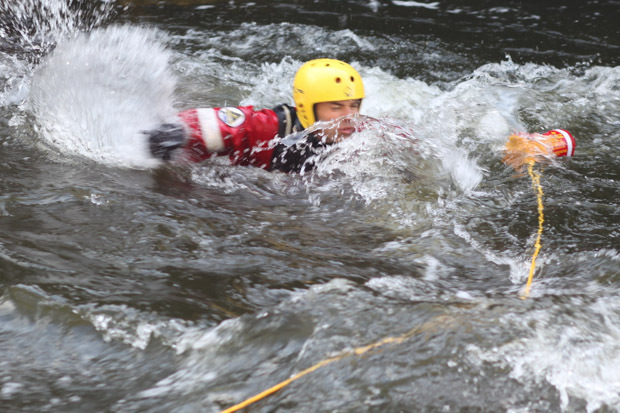 Once set up, group members may cross by putting an arm over the line and letting the current push them across the river. This method still relies on one member of the team to be able to traverse the obstacle by another method but is very stable. You should never tie in to the line. Defensive swimming conserves energy and allows the swimmer to fend themselves off rocks with their feet. Getting your ferry angle right allows you to steer yourself downstream: to travel to the right, point your feet away and head towards the right. Once in the right position, the swimmer can flip over and swim aggressively for the sanctum of the eddy. Where possible it’s always a good idea to have downstream protection in place. Those who miss their intended exit can be rescued with a throw line. Before throwing a bag, eye contact must be made with the swimmer and instructions given. White water is noisy so this needs to be loud! If the bag misses but is close, the swimmer should make every effort to reach it; it’s quicker than re-throwing the bag but be aware of how difficult it will be to see from the perspective of the swimmer. They will need positive direction from you. All of the above techniques require practice to get them right and the power of moving water should never be underestimated, even when it is shallow. Cross water only as a last resort, make sure that you are able and that your planning is complete and realistic. Remember: WASPTAR. 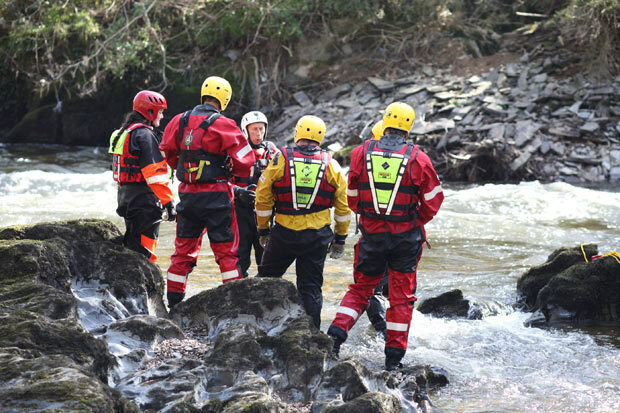 For the second year, ISAR provided the team with an invaluable insight into this truly relentless element and we would like to extend our thanks to all those who took the time to give their expertise. For first hand experience of travelling over and crossing water, join us on the Journeyman Course, Canoeing in the Ardeche or the Woodlore Canadian Wilderness Canoe Expedition. 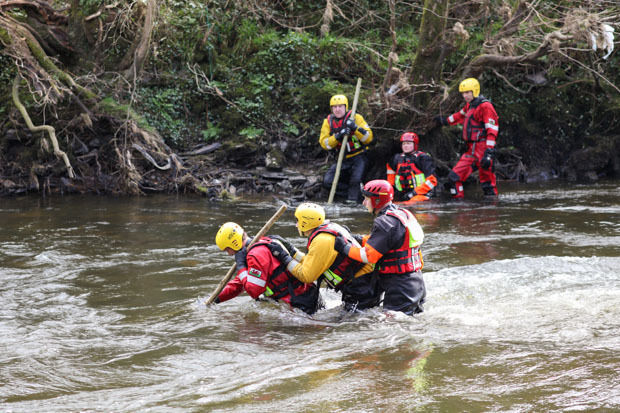 This entry was posted in Bushcraft Courses & Expeditions, The Woodlore Team and tagged assessment, Canoeing, ISAR, journeyman, river crossing, Staff training, Swift water, training, WASPTAR on April 7, 2014 by Woodlore Limited. 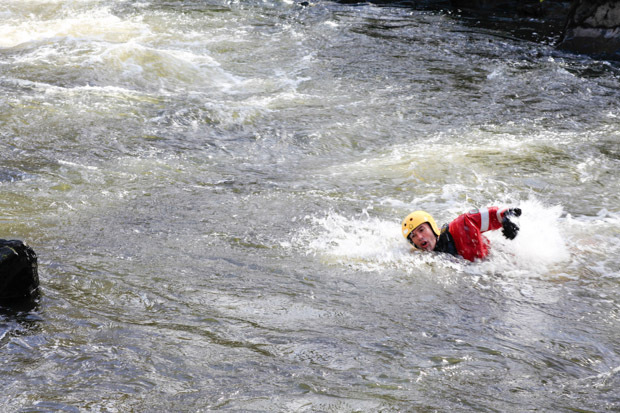 I did my SRT course a few years ago while a member of a search and rescue team. It is one of the most useful and rewarding courses I’ve ever done. 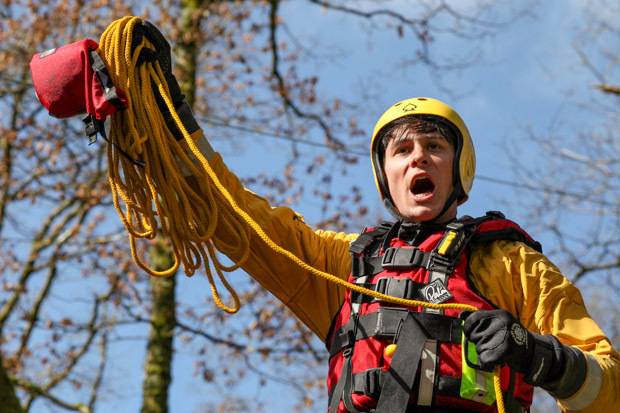 Apart from skills learnt (and also put to good use with the rescue team) I came away with an even greater respect for water and what nature can do with it.